Step1 : Register for Gtalk2Voip account. Click here to know more about it and how to do it. It will just take seconds for you to register. Step2 : Click on the SERVICE BOT in your GoogleTalk and send “MYPAGE”. A link will be displayed and you can click it to reach your personalized page. Host – SIP server/proxy domain name. Port – Leave it as it is (5060), else check your provider for details. Techprefix – Add ‘+’ or ’00′ (without the quotes). This is used to skip prefixing ‘+’ or ’00′ before an international number while making a call. Step4 : Press Save to save the changes. Step5 : Go back to your Home on personal account page and choose Define your dialing plan. Order – order number, used to select this dialing entry when callling, values are: [1 – 1000]. 1 means “choose me first”. Step8 : Log out of Google Talk and Log in again. Call . Please note the number should be in international format without ‘+’ or ’00′ prefix. For Ex: To call to UAE mobile number use CALL 97150XXXXXXX , where XXXXXXX denote the number. Step10 : Accept the incoming call from service bot and wait for it to connect you to the number. 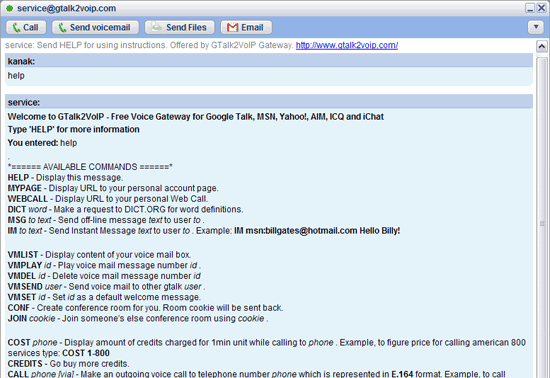 Thats all, now you can use GoogleTalk to make PC to Phone VOIP calls using your Intervoip or FreeCalls Account . Please note : You can type COST to check the rate via Gtalk2voip. Most of the times, you will be able to get good deal than your existing PC to Phone Voip Provider. Sometime back I posted , how to make VOIP calls from mobile using SIP . However , due to the complicated structure of inbuilt SIP settings , we used one of best mobile voip software called Fring. Here we will learn how to make VOIP calls using SIP via Talkonaut , one of the best alternative of Fring. Since Talkonaut is the mobile client provided by Gtalk2voip , the process is exactly the same, i.e add SIP client and chose it as the default Dialling plan. Step 2 : Login with your Google Talk id. Step 3 : Go to MENU , and Click SIP and select SIP accounts. Step 4 : Click ADD from the MENU. Step 5 : Select Others from the options. Step 7 :In the MENU select DIALING PLAN , and Add details. Step 8 : Select CALL number option from the MENU to make VOIP calls from your mobile. I am using Talkonaut to make calls from my Nokia 5800 . The voice clarity is very good and is just like calling via PC. You can not carry your PC everytime, but having such a useful option on your mobile, will enable you make low cost voip calls anywhere and anytime.